4 ft. 5-inch Left Drain Walk-In Whirlpool and Air Bathtub in White Walk-In's provide a safe and independent bathing experience. Using the latest in tub crafting techniques and industrial grade materials Walk-In Tubs offer an impressive line to meet your specific needs. Walk-In Tubs offer the satisfaction and peace of mind needed to truly enjoy a luxurious soak or a vibrant, soothing experience. 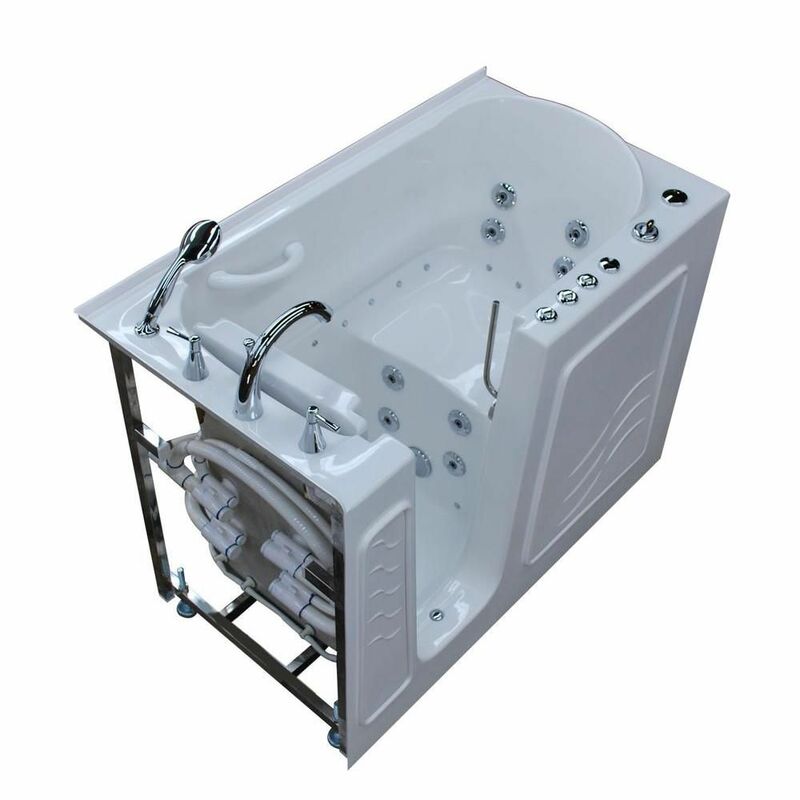 4 ft. 5-inch Left Drain Walk-In Whirlpool and Air Bathtub in White is rated 4.7 out of 5 by 7. Rated 4 out of 5 by Melody from The tub is excellent. Customer service through the company... The tub is excellent. Customer service through the company that makes the tub isn't that great. Was missing 2 parts, and have had a very hard time getting them. Still waiting on the drain knob, finally got the drain plug. Otherwise, I would have rated excellent. Rated 5 out of 5 by rosebudd from The 26 inch tub, had no problem taking in through the doors. The only problem I had was a leak wh... The 26 inch tub, had no problem taking in through the doors. The only problem I had was a leak when testing it before installing. the company sent new parts and paid to have them replaced. Rated 5 out of 5 by PADRO from the sides could be a little higher than the water because of splashing out some from jets for a l... the sides could be a little higher than the water because of splashing out some from jets for a large person needs wider door. for me it works fine with a bath towel on the floor. Rated 4 out of 5 by kj1g from Great Except.... This is a great tub and was an excellent purchase due to end of the year pricing. Everything worked as advertised. However there are a couple of things I did not like. 1) If you install it yourself, the warranty is voided. What happened more saving more doing. 2) 3/4" flex hoses for the supply line connections were not available at Home Depot. I had to do some innovative plumbing to solve this.